Large Gemstones for Kids Party. Let the kids find the polished rocks in the sand. 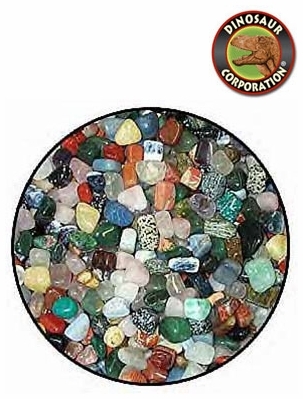 * Great activity for schools, summer camps, kids parties, gemstone mineral educational events. * Polished gems Blue Lace Agate, Grey Bostwana, Howlite, Rose Quartz from Africa, Unakite, Amethyst, Citrine, Hematite, Rutilated Quartz, Smoky Quartz and Agate from Brazil, Mookalite, Red Snakeskin, Rhyolite , Brecciated Jasper and Tiger Iron from Australia, Dalmatian Jasper, Snowflake Obsidian from Mexico, Peridot, Picasso Jasper, Picture Jasper, Quartz, and Petrified Wood from USA and more. * Polished Gemstones Size 3/4" - 1 1/4". * 95-110 polished rocks per package.